Snow is in our forecast this coming weekend. Driving through the dark, city streets on our bi-monthly date night I pondered the cold winter months. We are moving to Honduras soon. In fact, while I’m typing this we’ve been back in the States for three days after a week-long trip. I miss the warm weather – even if it did rain. The warm weather does a heart good, doesn’t it? Living in an area where we get all four seasons (maybe not equally, but we do get to experience them) makes me appreciate the warm weather even more. Our lives follow similar patterns, don’t they? 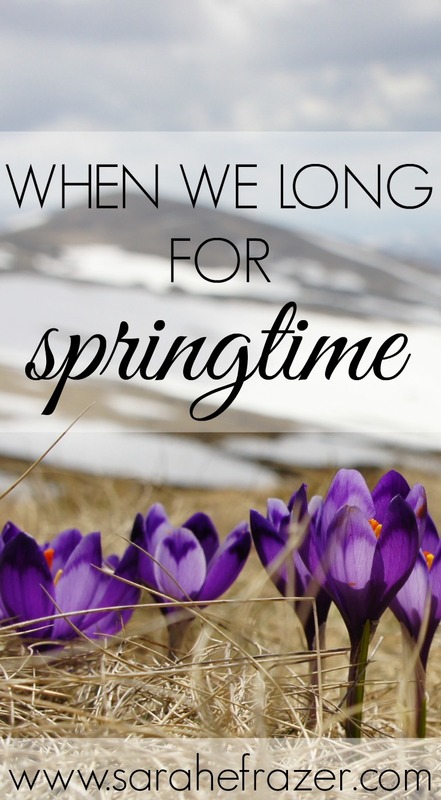 We often find ourselves going from Springtime feelings to the dead of winter: all based on our circumstances. Divorce. Cancer. Death. Loss. Goodbyes. Change is hard and often times it brings the ‘winter-like’ feelings to our hearts. Only God is here, in the winter. You can read what He taught me during a rough winter season of my life here. Longing for spring causes me to forget to find the beauty in the winter season. Looking out my window, I’ll be honest, the lack of pastel or bright colors is discouraging. The green is sparse and brown is the theme for nature. My gaze is immediately drawn to the little picture taped to my window. Do you see it here? My sweet little girl drew me a rainbow on a piece of paper. I was busy putting dishes away, so I waved my hand at her and told her to cut it out and put it up on my desk for later. I came up to write and saw it looking at me. 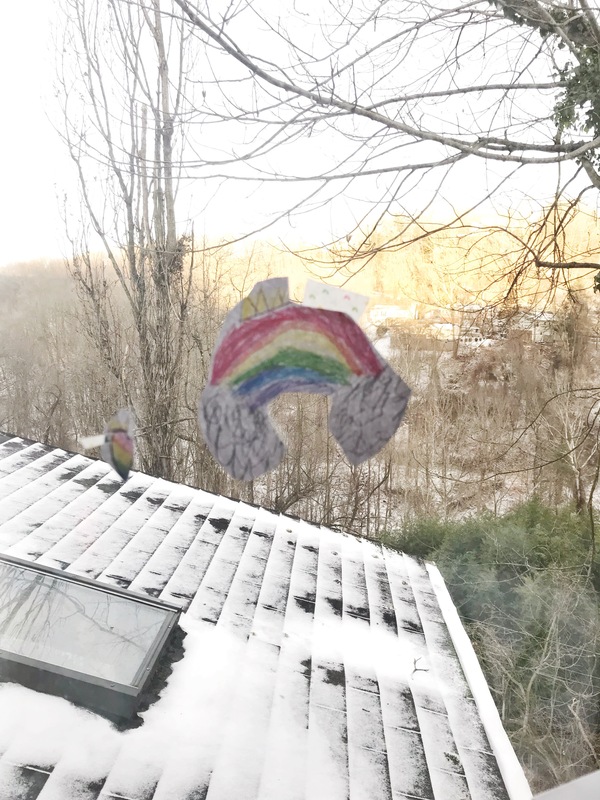 She had drawn a rainbow (with a crown on it) and a heart (with a crown on it) and taped it to my window with rainbow tape. When I look out my window, it is easy to focus on the brown grays of the empty, dead trees. Instead, I turn my focus to the rainbow. It reminds me of my sweet girl who loves me so much – and in turn I think of the Father who loves me even more. When we long for springtime it is easy to get distracted by the circumstances – but we will miss the beauty and joy right now – right here. God loves me. His word is truth. There is beauty within the walls of my home. Not in the pictures or rugs….but with the people who share this air wit me. The rainbows can be handrawan, you know. The rainbow she drew is a little messy but to me it is bright and beautiful. A wonderful picture of her. A lovely reminder to draw the rainbows we need to see and to be ok if it looks a little messy. My living room is covered in toys right now; but the beautiful thing is my children are playing happily. My desk is cluttered with papers, but words are flowing from my fingers. Springtime won’t be perfect when it gets here either. Allergies, bugs, and the rain will all come when winter says goodbye. If you are waiting for this hard season to just pass, thinking the rainbows will bring easier days – you might be disappointed to find a thunderstorm right around the corner. Instead, I encourage you to find God in the middle of WHATEVER circumstances are swirling around. My heart is heavy thinking of the woman walking around tying to keep her smile on her face without the Bible giving her a special peace. If you are that woman – and you just don’t know where to start – let me encourage you to start here. 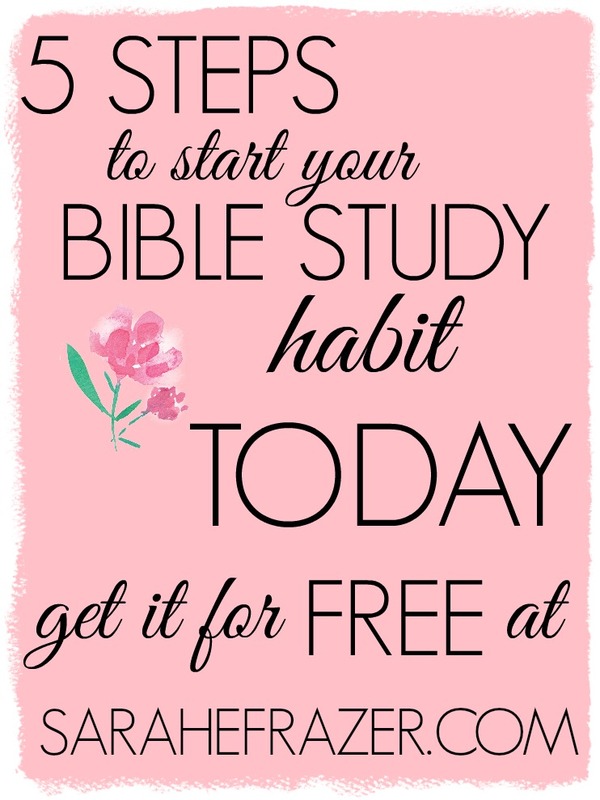 Developing a Bible study habit is MUCH easier than you think! Joining my email list you will find the encouragement and tools you need to find God for today.